La Torre is slightly off the beaten path in Arcahueja. 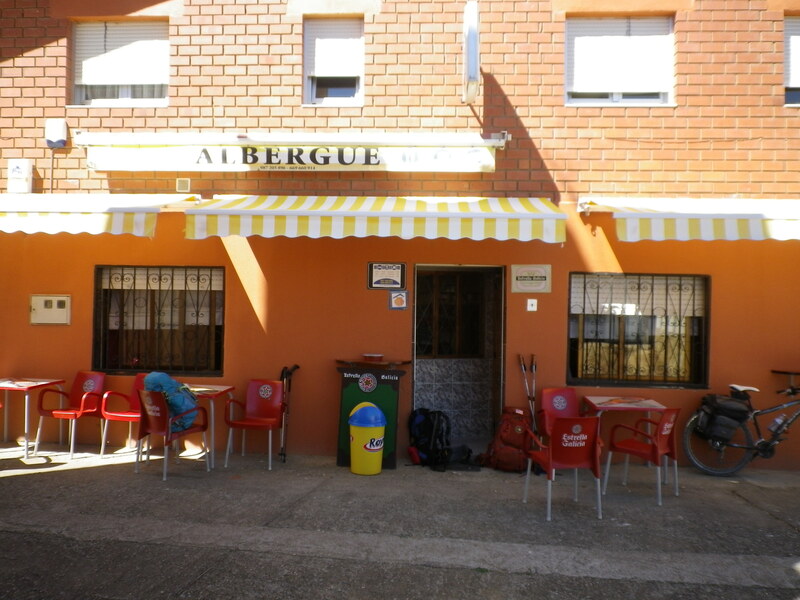 Continuing into Leon, I stopped at a small but well-known bar and albergue, “La Torre,” to get some food and drink. It was the middle of the day and it was hot and dry. I was the only person in the small bar, which suited me fine. The hospitalero was friendly and welcoming and there was toilet paper in the WC. I had already had several friendly encounters that day. First thing that morning, I had come to a bar for my morning coffee and croissant only to discover that the bar was in crisis. Their coffee maker, the big gleaming metal machine found in every cafe, capable of spurting individual cups of foamy cafe con leche in under a minute, was broken. This was a major problem because the line of pilgrims looking for their morning “cuppa joe” was just beginning. But the machine was broken. Fini. Kaput. Nada. No coffee, no milk, No happy pilgrims. The owners came up with the best solution they could on short notice on a Saturday. They had a small Mr. Coffee and a carton of milk and they apologetically splashed hot coffee into cup after cup as pilgrims came into the bar in a steady stream. A month ago, I wouldn’t even have noticed. Now, after almost a month on the road, Mr. Coffee seemed completely out of place. I knew, in my heart, that there was no way this would be an “authentic” cup of cafe, but I felt the pain of the hospitaleros as they made pot after pot of coffee, running out and then having to wait while the next pot brewed. At least the coffee wasn’t sitting on the hot plate for long. I had my coffee (coffee, not cafe, it made a difference to me), wished them luck, and continued walking. Shortly after, I met a local man who was out for his morning stroll. He stopped and wished me a very fine morning. It had been a long time since a local had given a greeting that was more than just a smile and a nod. We had a short conversation in my very halting Spanish and I felt good as I continued walking. 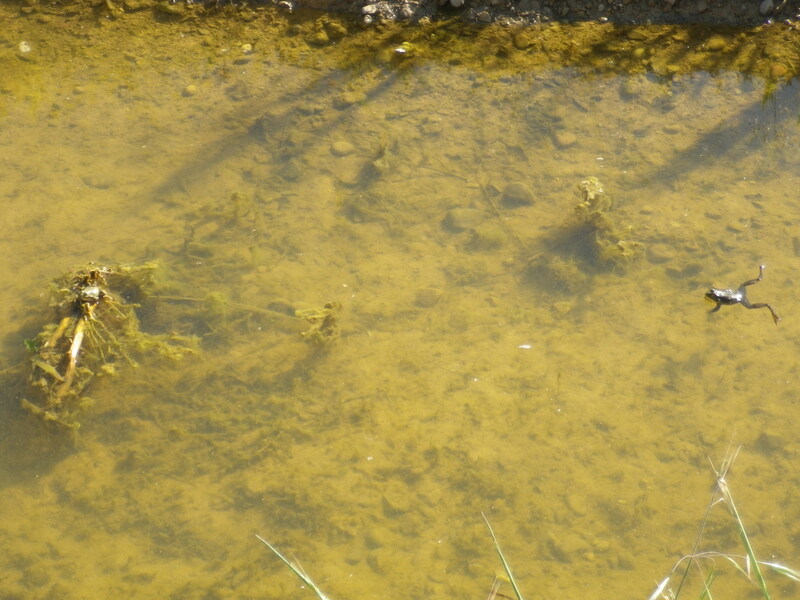 Walking along a stream, I heard a familiar sound. This time, I stopped and really looked. Yes, there! I finally saw one of those elusive raneros I had heard about from Carlos days earlier when we left El Burgo Ranero. So small but such a big sound! I encounter a local eager to chat even if we didn’t speak the same language. Continuing, I met another local women out for a walk. Her friendly greeting and smile warmed me like the sun and we began to chat. She asked questions about where I was from, how long I had walked, where I was going? She asked if my clothes were comfortable, was everything in my backpack, was it heavy? I learned that most of the pilgrims she ran into on this part of the Camino, which ran through her neighborhood, didn’t look approachable. Their heads were down, their eyes shaded, they determinedly planted their hiking poles with each step, They all seemed focused on getting one foot in front of the other and she never felt comfortable interrupting them with conversation. But, oh, the questions she wanted to ask. Why are you walking? What have you seen so far? What are the people like? Where do you sleep? My answers were as complete as I could make them. I asked how long had she lived here? Had she ever walked the Camino? What is Leon like? 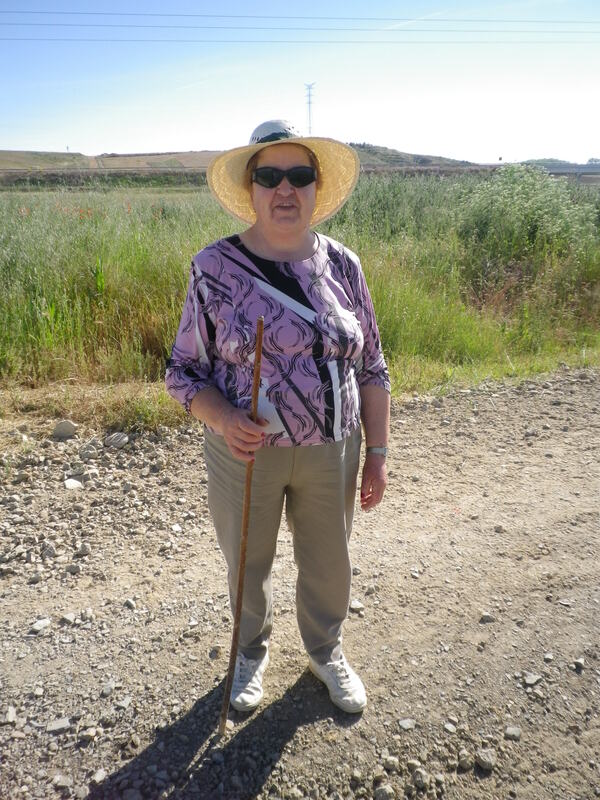 She herself had never walked the Camino and now she felt she was too old. Now it was lunch time (OK, early lunch, I still needed a real cafe fix) and I was at La Torre. The simple menu appealed to me. I decided it was too hot and late in the day for coffee and went the beer route. The hospitalero saw me wipe sweat from my forehead as I dropped my pack outside and he asked whether I would like an ice-cold frosty glass for my beer. My eyes teared up in joy. The hospitalero at La Torre was ready with a fast taxi, a cold beer, whatever. Bliss was mine as I sat outside in the shade and ate a tortilla (not as good as Sinin’s, whose I mentioned in an earlier post, but not bad) and washed it down with the iciest beer I’d had in a loooong while. Karen, a nurse from Australia, and another pilgrim, a young woman from Germany, arrived at the bar. They were tired and thirsty. Karen was limping heavily and as soon as she sat down she began massaging ointment onto her knees. It was at least another eight kilometers to Leon. They considered their limited options and finally decided to try to find a ride into the city. They didn’t speak any Spanish so I offered to try to arrange transportation. I haltingly asked the hospitalero if there was a taxi available (I hadn’t seen any cars in the village) and he told me that he had a relative who had a taxi and could take us into Leon. I hadn’t thought of going along for the ride. I told Karen that a taxi would be available and the cost would be reasonable if it was split. After some back and forth – did they want to take this taxi, how much would it cost, when could it come to pick them up – business was settled and soon a clean, new van parked in front of the bar. I used my “Espanol muy primitivo” to check the arrangements for the women. They asked me to ride along. They even offered to pay in return for my helping them. I thought about it. There was not a cloud in the sky, which meant that the sun was really burning down. Siesta time was approaching and the roads would be devoid of people. Taking the taxi would get me to Leon in 20 minutes instead of 3 hours. Having walked about 430 kilometers straight, there would be no shame in taking a 20 minute taxi ride. Yet, I declined their offer, breaking my new rule of always accepting what is offered. Getting into a vehicle at that point seemed as out of place as, well, drinking a cup of Mr. Coffee. My mind was on walking, slowly, carefully, strongly. Let the adventures find me along the road as planned. I saw them drive away, slightly regretting my choice as I thought about how quickly they would be in the city and how much trudging l had ahead of me. The beer was no longer cold, the tortilla was finished. I said “adios” to my hospitalero friend, hoisted up my backpack, and headed out. This entry was posted in camino de santiago de campostella, Fitness, Spain, Travel and tagged backpack, Camino de Santiago de Campostella, hiking, Spain, Travel, women hikers, women hiking solo. Bookmark the permalink. I had forgotten that poem. But it is so true! How many times I took the “optional” route, or separated from my new friends and continued when they had stopped or stopped when they had continued. Those were the times when, more often than not, the unexpected happened. I’m sure there’s a life lesson in there, but I haven’t fully assimilated it yet. Still too fresh maybe? Kathy – another great post. You are so good with words, and your images are great too. Your blogs really do give me a sense of being there with you. The taxi was a real test, hey? I bet you’re glad you didn’t take it. The trek into Leon is a long haul, but at least it’s interesting – at least I found it interesting going through all those outer areas. And that blue bridge that you took a photo of – isn’t that wild? The heat’s the thing – it must be so so difficult in the heat. I had four layers on when I walked into Leon, and that was mid afternoon! I know how long it takes to do a blog with this level of proficiency – and it’s great that you’re doing it. Keep it up. And I hope you love Leon. 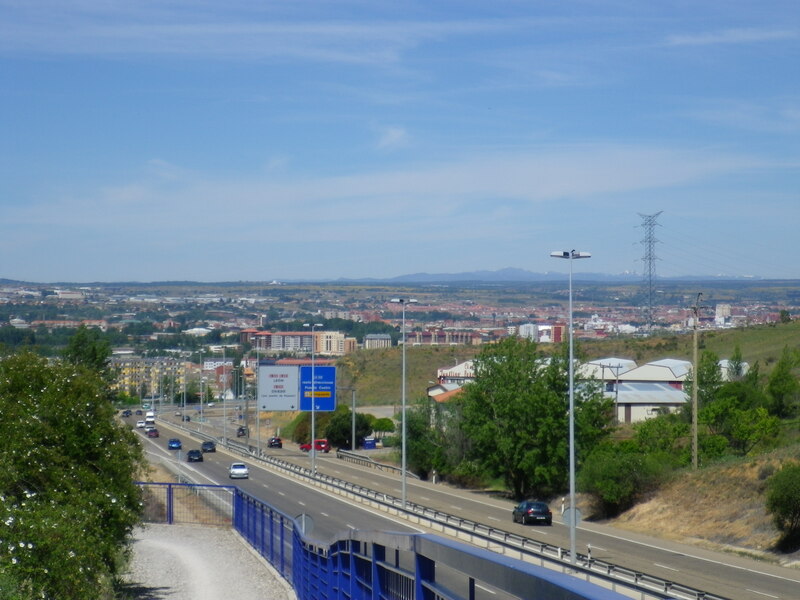 It to me is the best of the big cities along the Camino. There is something very solid about the place. I didn’t like Leon at the time! I’m not sure why. But now, as I look back through my journal and start to pick out what to write about, I’m realizing all the great things I wrote down about it. I know that doesn’t make sense. But I think I like it better now, looking back, than when I was there. How is that possible?? Yes, I am glad I didn’t take the taxi. As always, the adventures happen when you’re on the road, not zooming over it. That blue bridge was amazing – the blue was startling after so much monochromatic landscape, and the architecture was so “jagged”, zig-zag, after so much flat. A spash of cold water in the face that said “Welcome to the city, Dude!” ..